Andrew Nedelchev 17 февруари 2014 г., 11:03 ч.
O6OPoTEHb 7 април 2014 г., 15:34 ч.
Анонимен 8 април 2014 г., 20:27 ч.
Много благодаря за Звезден миг". Песента е свързана с детските ми години, пеехме я сутрин в училище. Отдавна я търсех. Paul Harvey 17 март 2015 г., 19:36 ч. Many thanks for all the wonderful records you share and the hard work you put into restoring them, the audio quality is excellent. 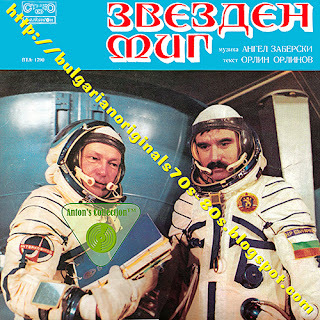 I am a huge fan of Eastern Bloc/Soviet era music and films about space, UFOs and science-fiction themes - so this discovery is great. I can only translate the titles into English using Google Translate, but it is still such fun listening to it and the cover is great.